London’s deputy mayor for transport has called on ministers to speed up the extension of Oyster and contactless payment to airports near the capital. In a letter to rail minister Jo Johnson, Heidi Alexander has pointed out that Transport for London has consistently supported expanding the technology to airports such as Luton, Stansted and Southend and asked for an update on when ‘these crucial extensions will be rolled out’. She pointed out that since pay-as-you-go was introduced at Gatwick, it now accounts for a quarter of all trips from the airport. ‘This has completely transformed the way that people travel by making it far quicker and easier to pay, as well as delivering much greater confidence and flexibility for travellers,' she wrote. Ms Alexander also pointed out that it was 'especially important' to contactless, as in 2020 London will host a total of seven games in the UEFA European Football Championships, including the semi-finals and final. The mayor’s office said that based on its previous experiences, any costs for introducing the technology would probably be more than recouped by extra people choosing to use the trains in the future due to more convenient ticketing options. It said that while the costs have not been defined it would expect them to be picked up by the train operating companies (TOCs) but suggested that they would see revenue increases of up to 5% . Mr Johnson said: 'I have already asked DfT officials to work proactively with TfL to explore these proposals to make London shine in 2020. 'Our goal is to ensure that across regional and urban commuter areas, smart ticketing can deliver the kind of pay as you go structure that is used in London, with the systems automatically charging fares at the appropriate level. 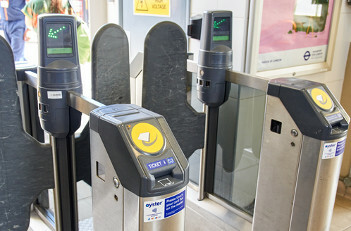 While contactless and Oyster are popular methods of travelling on rail and other transport services, the Government has mainly focused on TOC smartcards and barcode tickets as part of its plans to give ‘all passengers’ the option of travelling without a paper ticket by the end of the year. However, as Transport Network has previously reported, the rail industry is set to miss this target.